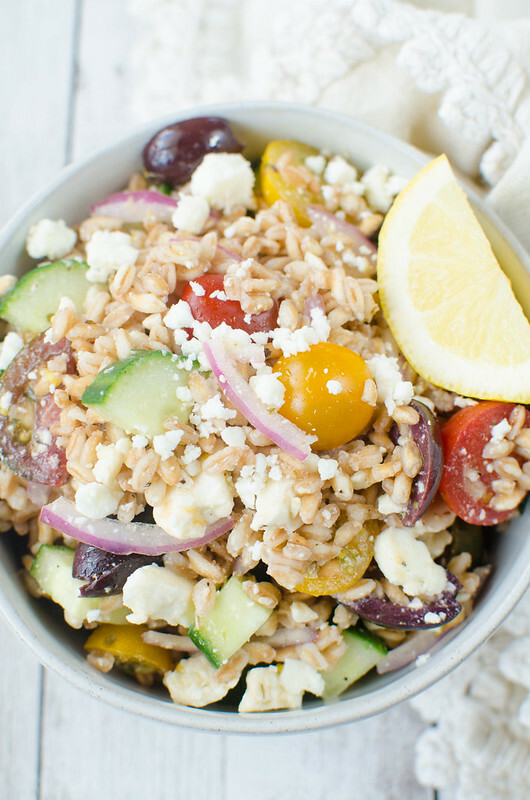 Greek Farro Salad – Farro, cucumber, tomatoes, kalamata olives, red onion and feta cheese tossed in a light lemony dressing. 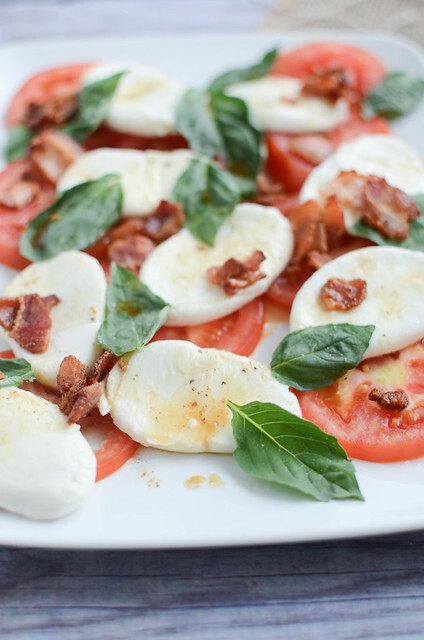 Perfect healthy lunch recipe! Kids are officially back from their summer trip. My house is loud again. Wanna know how I spent my last day of freedom? I went to Trader Joe’s. Duh. I currently have the cold that won’t go away and I told BF I was going to Urgent Care but I ended up in Austin because a poke bowl sounded better than Urgent Care. And since I was down there, I couldn’t pass up the opportunity to stop into Trader Joe’s to see if they’d restocked cauliflower gnocchi (they had) and get some flowers for my kitchen. Does everyone go to Trader Joe’s and just buy a bunch of stuff that you don’t really have plans for? I bought that new Jalapeno Lime Almond Dip weeks ago and it’s still sitting in my fridge unopened. 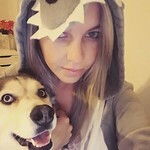 Just because I’d seen it on Instagram. And I buy the tiny heirloom tomatoes every single time I’m in a Trader Joe’s even though I know dang well that 6 year old and I are the only ones that will eat them and there’s no way we can go through the entire container. But they are so tiny and pretty and I can’t resist them. So that’s how this recipe happened. Because I refuse to throw them away like the entire bag of teeny tiny avocados that I bought 3 weeks ago that I just knew BF and I would eat. We ate none of them. I love farro. It’s probably my favorite grain. Give me farro over quinoa any day. It’s a bit chewy so I think it’s perfect for a cold salad with lots of different textures. 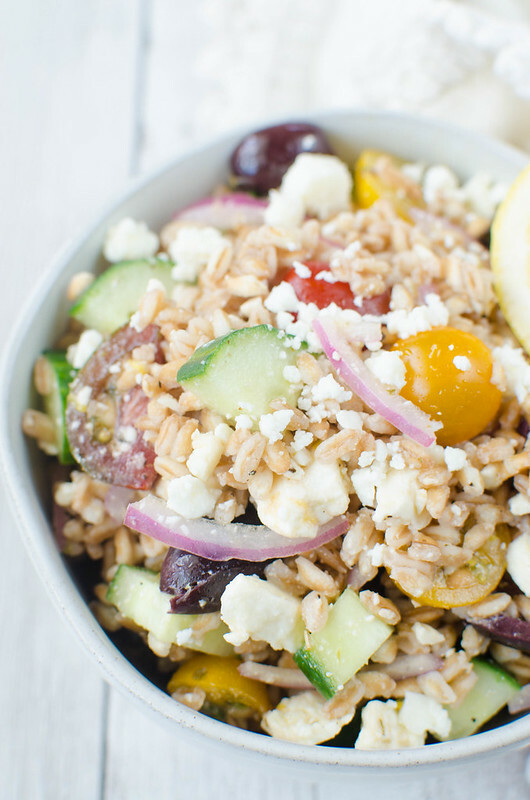 This salad is the farro (it cooks in just 10 minutes! ), cucumbers, those dang tiny heirloom tomatoes, kalamata olives, and red onion. And then that’s all tossed in a really simple lemon dressing and then you toss in some crumbled feta. So many flavors, so many textures. I love a salad like this. 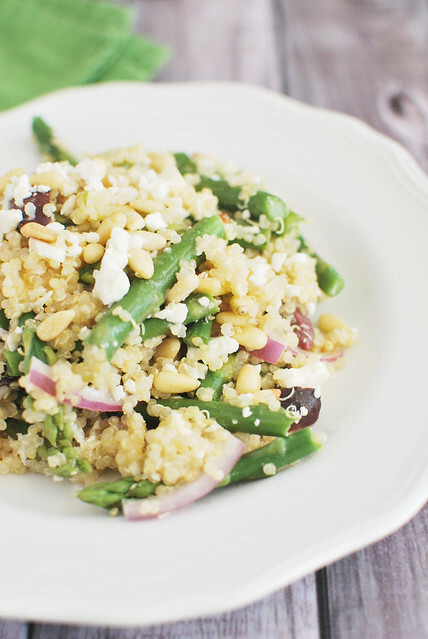 You could totally add in some chicken or some chickpeas if you want to add some protein. It’s keeps well in the fridge for a few days so it would be great to make to take for lunch throughout the week! To make the dressing, whisk all ingredients together until combined. 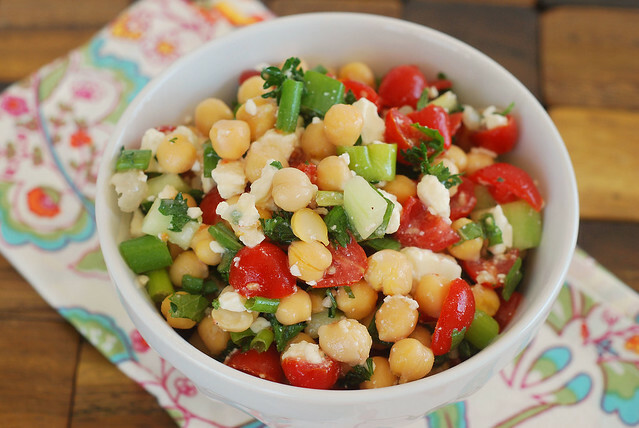 To assemble the salad, Add all ingredients but feta cheese to a large mixing bowl. Drizzle dressing over top and toss to combine. Stir in feta before serving. 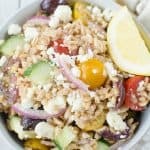 2 Responses to "Greek Farro Salad"
Truly the perfect healthy lunch recipe! I grab a cart at TJs even if I’m there for one thing because I don’t think I’m allowed to leave that place without a whole haul. 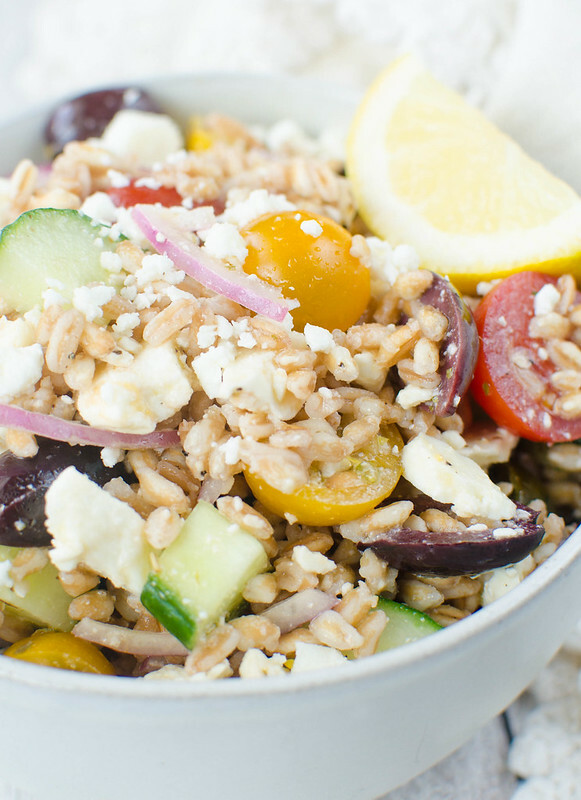 Love all these flavors with the farro! !